Rev. Francis X. Chouinard, CSV, died Dec. 4, 1905 in Beaverville, IL following a brief illness. He was 74. Fr. Chouinard was born Jan. 30, 1850 in Rivière-du-Loup, Quebec, Canada as the son of a good Christian farming family. His classical studies were completed at Collège Saint-Anne de la Pocatière. After college, he joined the Christian Brothers in Montreal, but he withdrew to become a priest. In 1852, Fr. 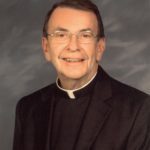 Chouinard entered the Clerics of St. Viator novitiate in Joliette. He professed his first vows Aug. 25, 1853 and his perpetual vows on Aug. 9, 1859. During these years, he taught in Boucherville and Lonqueuil. Fr. Chouinard realized his dream when he was ordained to the priesthood on Dec. 30, 1860. For his first assignment, he was named director of the Viatorian College in Rigaud, where he remained for 18 years. He developed the college, building a stone wing with a chapel and changing its name to Bourget College after the Rev. Ignace Bourget, Bishop of Montreal from 1840-1876. 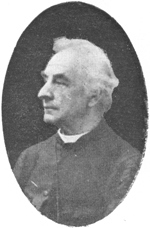 In 1878, Fr. Chouinard traveled to the United States and began work at St. Viator College in Bourbonnais. One year later, he left to minister at Sacred Heart Parish in Aurora, IL caring for Canadian parishioners. During his years at Sacred Heart, Fr. Chouinard also oversaw the building of the parish school, the first Catholic school in Aurora. Fr. Chouinard’s next assignment came in 1884, as pastor of St. Joseph Church in Manteno, IL. It was during these years that he published a small catechism in French that was widely used. However, his pastorate came to a dramatic close, when in July of 1898, St. Joseph’s burned to the ground. Fr. Chouinard then moved to nearby St. George, IL to become the pastor of St. George Parish, where he remained until his retirement in 1903. In the fall of 1904, Fr. Chouinard visited Beaverville, IL, where he planned to help his confreres at St. Mary’s Church during the winter. It was here that he became ill and died. The funeral took place Dec. 7 at St. Mary’s Church. Fr. Chouinard was buried in the church cemetery in Beaverville near his confrere and friend, the Rev. George Langlais, CSV.